Sadly, the bee tree was a casualty of the tree destruction that was going on. 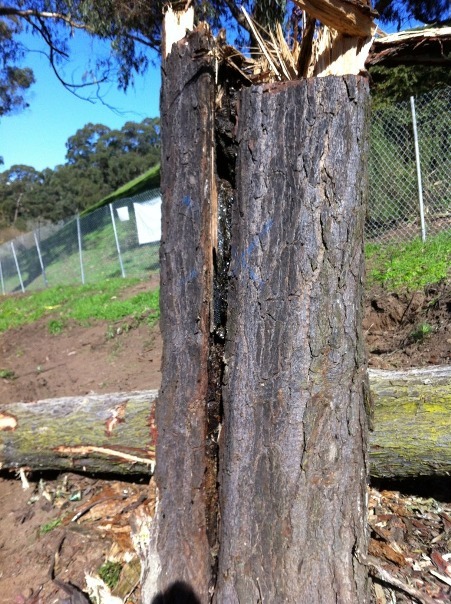 We had understood that the bee-friends of San Francisco had talked to the SFRPD, and they agreed that the stump would be cut off at 20 feet, preserving the bee’s nest within its hollow. That tree was cut down on Jan. 19. The agreement with Rec & Park was to cut the tree at 20 feet. It was cut at 5 feet. The colony’s nest was more than 5 feet tall from ground to top. The cut not only penetrated the top of the nest, it also split the trunk and exposed the entire length of the nest. By Jan. 21, most of the bees had left. A concerned resident/beekeeper attempted to rescue the queen and her retinue. We hope her effort will prove successful. Needless to say, this was a disappointing performance by the city in making good on it’s commitment and partnering with concerned residents who made a good faith effort to find a way to protect this resource. Edited to add photographs of the destroyed hive, courtesy Scott Mattoon. 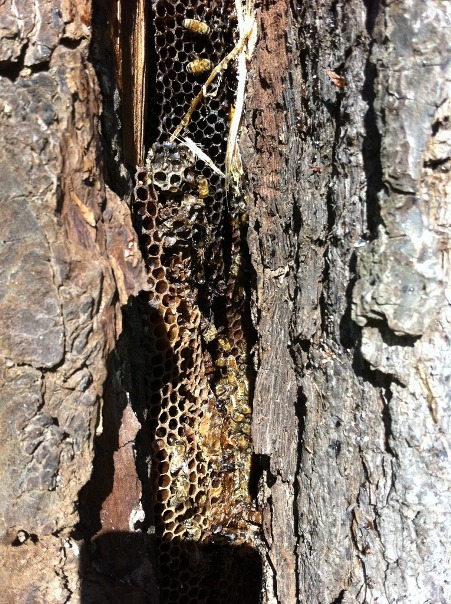 1) SFRPD had killed another feral bee hive only last year. There’s a report on that HERE, on the SaveSutro website, that optimistically ends with “Still, it’s reassuring to know that the destruction was accidental and that SF NAP is taking steps to prevent a recurrence. This may help to preserve the other nests we know are in Glen Canyon.” Really? 2) It makes any kind of assurances from SF RPD difficult to accept. They may be made in good faith, but implementation may be questionable. We wonder, for instance, if the 160 trees-and-shrubs will actually get planted and nurtured to independent viability. 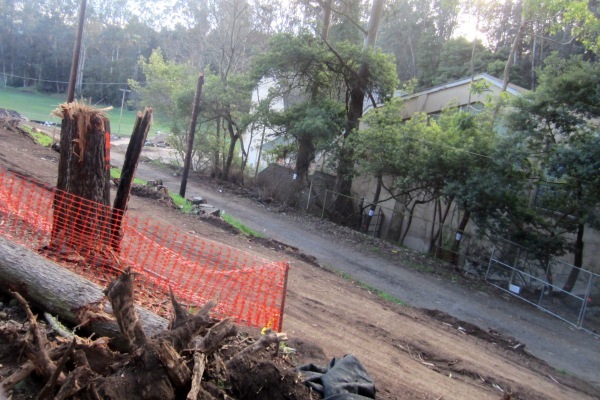 This entry was posted in Impacting Wildlife and tagged bees, environment, Glen Canyon Park tree-felling. Bookmark the permalink. I am reading these posts, seeing the destruction and getting sadder and angrier by the day. I understand the funding for these projects was bundled into a bond that was approved by voters; has anyone considered trying a ballot initiative to de-fund NAP? As a longtime resident of the city, for example, I have seen district elections voted in, then voted out, several times. 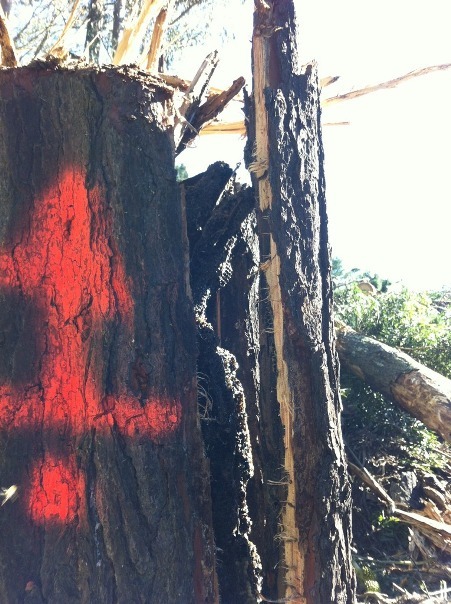 The stump shown in these pictures has since been completely removed. No trace of the thriving honeybee colony remains. I agree with Anne; the 2008 Park Bond Fund is allowing the wasteful spending to occur at the expense of our parks; a ballot initiative to de-fund NAP? – Brilliant idea! Lets get some groundswell on this matter!